Even in the slowest paces of societies, there is an expectation of growth and self-improvement; the idea that life is a developmental journey that can only be considered successful if we can overcome the biggest obstacle…ourselves. From early childhood we are taught that whatever it is we are doing wrong, we must correct it. By focusing on and mastering weaknesses we must transform ourselves from mediocrity to an eventual apex of self-actualization; or at least, learn to hide our weaknesses from those who might outshine us. Adults are then fed self-help books and seminars and told to be open to constructive criticism and feedback so that they can better themselves. All good concepts, really. Except that at some point we come face to face with who we are, what makes each of us different, and certainly what makes us interesting to each other. Yes, we want to be all we can be, and of course fulfill our potential, but I believe that it can also be achieved by focusing on strengths, and not spending so much time picking away at scabs. When M.C. 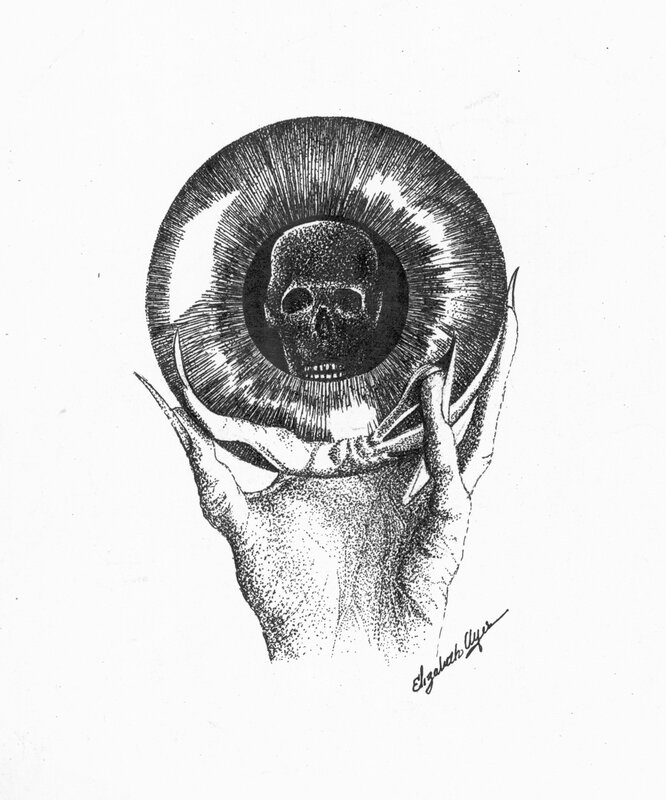 Escher drew his self-portrait through the reflection of a sphere, it produced an interesting piece of work, and because he did not present himself as perfect, he seemed very real, even as a reflection. Magazine models are beautiful, but not always interesting, because they are touched up to be perfect. The attraction is more to the aesthetic than the human.To rebel against the demand for self-perfection, this Pen and Ink Drawing I call Reflection by Elizabeth Ayers makes the point by pushing it a step further, mocking Escher in his neutrality, and finally allows the viewer to accept the unadorned mortality that we know to be real. So, when you look in the mirror, who do you see? Do you see perfection, or do you see a flawed personality? If beauty is in the flaws, then absolute perfection is not art. Don’t just forgive your imperfections, revel in them. This entry was posted in The Art of Life and tagged Drawing, Elzabeth Ayers, Pen-and-Ink, Pointillism, Reflection, stippling by Dawn Martin. Bookmark the permalink.